SIBU: Sarawak recorded 238 open burning cases from July 1 until yesterday. Sarawak Fire and Rescue Department director Nor Hisham Mohammad said 22 cases were reported daily over the past 10 days. He added there was only spike in cases after July 15 due to the hot and dry weather. Before that, the number was less significant. “But, it is still below the daily threshold of 40 cases needed to activate the forest fire operation room. “However, the current daily cases are still less compared to the highest reported cases in the last five years, which stood at 62 cases,” Nor Hisham said when contacted yesterday. Open burning cases include bush, forest and peat soil fires. Meanwhile, smoke was seen billowing from the bushes along Tun Ahmad Zaidi Adruce Road here. Jakarta (VNA) – Indonesian Ministry of Environment and Forestry (MoEF) has taken measures to prevent forest fires and smoke as the country will host the 2018 Asian Games (ASIAD 18) next month, which is the regular time of forest and peatland fire in Indonesia each year. Jakarta and Palembang in Sumatra are set to host about 11,000 athletes and 5,000 officials from 45 Asian countries for the games between August 18 and September 2. Raffles B Panjaitan, Director of Forest and Land Fire at the MoEF, said that Indonesia has overcome smoke over the last two years. Forest fire hotspots in some high-risk provinces such as South Sumatra, Jambi and Riau were timely discovered and handled immediately. A research group analyses data every day to give warnings and tackle forest and land fires by working closely with firefighting forces of the MoEF, police, army, private companies, and community. Currently, the MoEF has deployed groups of firefighters to 11 high-risk provinces, along with nearly 2,000 personnel from other forces to prevent forest and land fires. In addition, firefighting teams have been dispatched to nature reserve centers and national parks. In South Sumatra alone, five teams were set up and received training in fire prevention. According to the New Straits Times, West Kalimantan, Indonesia has reportedly been enduring some hot weather as of late, triggering a number of forest fires. It was reported that 194 hot spots were detected yesterday evening (19th July). 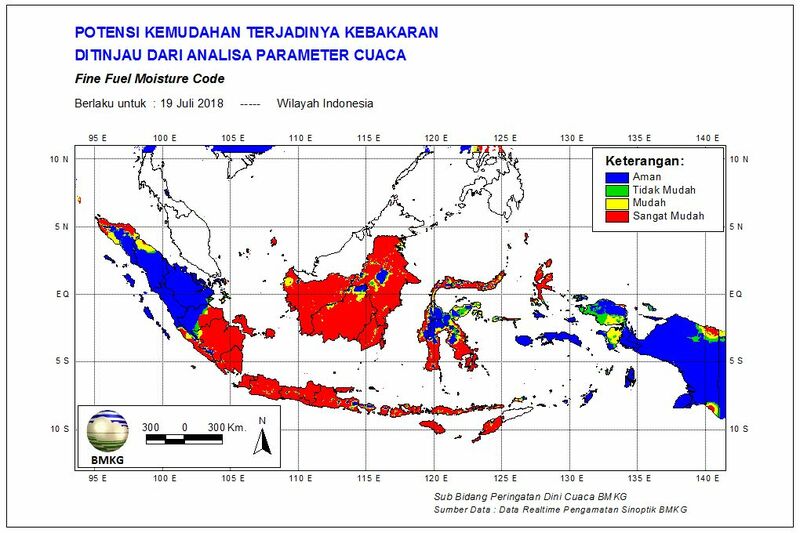 Indonesia’s Meteorology, Climatology, and Geophysics Unit revealed that chances for forest fires to occur in this region are very high as of yesterday, according to the most recent graphic published on their website. According to NST, out of the 194 hot spots in Kalimantan, 69 of them were categorized as high-risk areas where forest fires are very likely to occur, while 47 were rated with a moderate chance of developing fires. On top of that, forest fires spreading across hundreds of hectares have also been raging in Sumatra because of the hot weather, prompting authorities to double down on efforts to put out the blaze. Also, 11 helicopters are reportedly being used to extinguish the fires. Yikes, this does not look good! Meanwhile, the director of Sarawak’s Fire and Rescue Department, Nor Hisham Mohammad, told the daily that there have been a total of 112 cases of natural fires reported in the state within the past five days alone (15th to 20th July). So, looks like we should prepare ourselves for a possible haze coming over to our shores soon. Hopefully, it won’t be so bad this time!